Five major trade associations, the Association of Wall and Ceiling Industries International (AWCI), the Ceilings and Interior Systems Construction Association (CISCA), the Gypsum Association (GA), the Painting and Decorating Contractors of America (PDCA), and the Drywall Finishing Council (DWFC) presented the consensus document Recommended Levels of Gypsum Board Finish. The document was created to “precisely describe” the desired finish of walls and ceilings prior to final decoration. This precise description enables contractors to better understand the requirements of architects and building owners in order to enhance the satisfaction of the client. Specifications that include the Levels of Gypsum Board Finish also promote competitive bidding that allows the bidder to consider the correct labor and materials to finish the wall suitably for its final decoration. Recommended Levels of Gypsum Board Finish. The document has been promoted heavily to specification writers nationwide by local wall and ceiling associations and gypsum manufacturers. 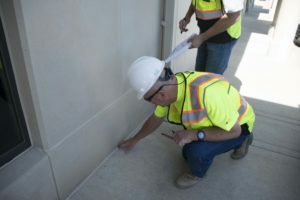 A modified version of Levels of Gypsum Board Finish has been incorporated into ASTM C 840, “The Standard Specification for Application and Finishing of Gypsum Board.” Included as Appendix X8, The Levels of Finish could even be incorporated into model building codes that utilize ASTM standards as reference documents. Publication in ASTM C 840 increases the industry’s awareness and acceptance of these standards. As a result of this, ASTM C 840 is a Referenced Standard in AIA, MASTERSPEC. The Levels of Gypsum Board Finish are specifically outlined in Section 09 29 00, Gypsum Board; Part 3 Execution. The above-mentioned trade associations periodically publish revised versions of the Levels of Gypsum Board Finish. The revisions are intended to clarify the operations required to fulfill the requirements of each level of finish. Additionally, changes have been made to further define the “skim coat” operation and clearly define “drywall primer” to remain current with recent developments in finishing products. Many of today’s project manuals include references to the Levels of Gypsum Board Finish. Specifiers should be aware of the recommended level of finish required for the final decoration for walls and ceilings and clearly specify this for contract bidders. Bidders should carefully read project specifications to ensure that bidding includes the proper level of finish to meet the standard set for final wall decoration. A Level 1 finish is recommended in areas that would generally be concealed from view or in areas that are not open to public traffic. Joint tape need not be covered with joint compound to fulfill the requirements of Level 1. In Level 1, the surface is left free of excess joint compound. Ridges and tool marks are acceptable for a Level 1 finish. This level is often specified in the plenum area above ceilings, in attics, or in service corridors. In some geographic areas this level is referred to as “fire-taping”. In garages, warehouse storage areas and other similar areas where the final surface appearance is not of concern, a Level 2 finish is the recommendation. Level 2 may be specified where moisture resistant gypsum board is used as a tile substrate. Level 2 reads, “All joints and interior angles shall have tape embedded in joint compound and wiped with a joint knife leaving a thin coating of joint compound over all joints and interior angles”. This differentiates Level 2 from Level 1. Joint compound is applied over all fastener heads and beads. The surface is left free of excess joint compound. Ridges and tool marks are acceptable for a Level 2 finish. Additionally, Level 2 includes the following sentence: “Joint compound applied over the body of the tape at the time of tape embedment shall be considered a separate coat of joint compound and shall satisfy the conditions of this level.” In the past there has been some confusion as to whether tape pressed into joint compound and covered with joint compound in a single operation fulfilled the requirements of Level 1 or Level 2 . In areas to be decorated with a medium or heavy hand and spray applied textures or where heavy-grade wall coverings will become the final decoration, a Level 3 finish is recommended. Level 3 states, “All joints and interior angles shall have tape embedded in joint compound and shall be immediately wiped with a joint knife leaving a thin coating of joint compound over all joints and interior angles. One additional coat of joint compound shall be applied over all joints and interior angles. Fastener heads and accessories shall be covered with two separate coats of joint compound. All joint compound shall be smooth and free of tool marks and ridges. Before final decoration it is recommended that the prepared surface be coated with a drywall primer prior to the application of final finishes. Level 3 is not recommended where smooth painted surfaces, light textures, or light- to medium-weight wall coverings become the final decoration. If the final decoration is to be a flat paint, light texture or lightweight wall covering, a Level 4 finish is recommended. As stated in Level 4, “All joints and interior angles shall have tape embedded in joint compound and shall be immediately wiped with a joint knife leaving a thin coating of joint compound over all joints and interior angles. Two separate coats of joint compound shall be applied over all flat joints and one separate coat of joint compound shall be applied over interior angles. Fastener heads and accessories shall be covered with three separate coats of joint compound. All joint compound shall be smooth and free of tool marks and ridges.” It is recommended that the prepared surface be coated with a drywall primer prior to the application of final finishes. In severe lighting areas, flat paints applied over light textures tend to reduce joint photographing. Paints with sheen levels other than flat as well as enamel paints are not recommended over this level of finish. Special attention should be paid to long corridors, large areas of wall, and large/multiple windows when specifying Level 4, because these areas are potential areas of concern in achieving acceptable wall finishes, and may need to be specified appropriately. Level 5 finish is recommended for areas where severe lighting conditions exist and areas that are to receive gloss, semi-gloss, enamel or non-textured flat paints. Level 5 requires all the operations in Level 4. Additionally, a thin skim coat of joint compound, or material manufactured especially for this purpose, is applied to the entire surface. A thorough explanation of “skim coat” is given in the comments section of GA-214. A skim coat of joint compound is intended to conceal small imperfections in joints and on the surface of the gypsum board to help conceal joints and create the appearance of flatness. A skim coat will also smooth the texture of the paper, minimize differences in surface porosity, and create a more uniform surface to which the final decoration can be applied. The Level 5 finish is required to achieve the highest degree of quality by providing a uniform surface and minimizing the possibility of joint photographing and/or fasteners showing through the final decoration.